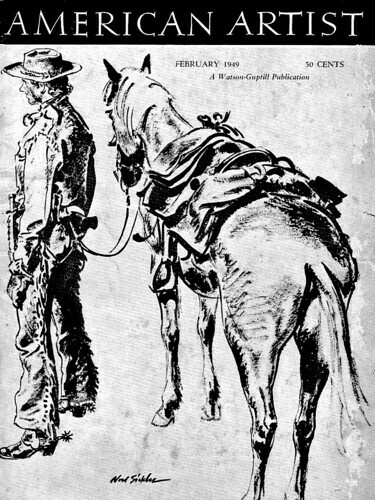 Today's Inspiration: Noel Sickles: an "inquisitive, restless genius"
Sickles's art reflects the exacting touch of a master craftsman coupled to a streak of inquisitive, restless genius. That genius drove him to constantly gather knowledge and seek outlets for what he learned. It kept him endlessly experimenting, testing the boundaries in order to push through them. Though not every experiment was successful, many were, and those successes allowed Noel to discover and explore exciting new creative directions. The dedication to his craft kept him bound to a standard of excellence, driving him to tear up nearly-completed work and begin afresh, unmindful of the fact those castoffs represented a level of skill many of his peers were unable to match on their best days -- if it was not Right, it needed to be abandoned and replaced by something that was Right. In his Society of Illustrators Hall of Fame tribute to Sickles, Harry Devlin wrote, "Noel had no hobbies - there was no golf or tennis. He had two loves - Louise and his work. He worked constantly, researching and ever improving that miraculous ability to draw." 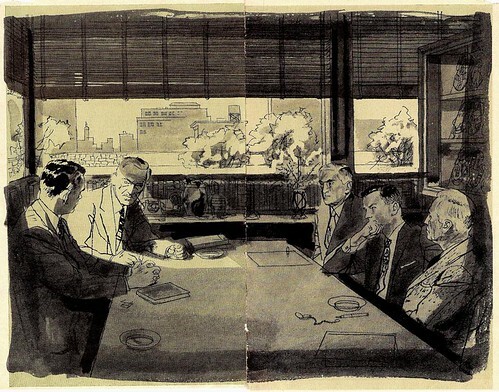 Although decades have passed since Noel Sickles added the final piece to his oeuvre, the passing of years has not blunted the vibrant appeal of that work. The range of material bearing his signature is savored by a steady flow of devotees in America and throughout Europe. It is periodically showcased to allow a larger audience to discover it anew: the faithful share their treasures, knowing the sharing will cause their ranks to be replenished. The love of his family - the admiration of his peers - the respect of his acquaintances - the lasting depth and breadth and power of his life's work. 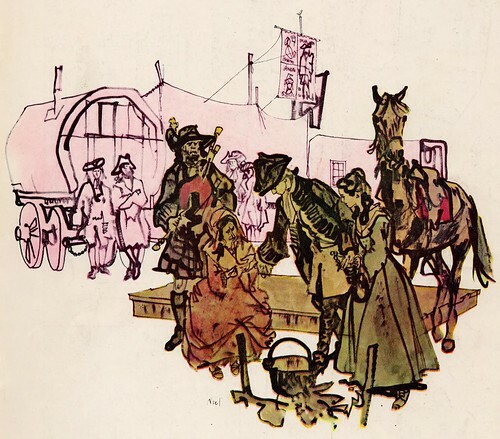 By any yardstick applied, one conclusion is inescapable: against standards so high few could aspire to them and fewer still could attain them, Noel Sickles measured up. As an artist. As a man. * My thanks to Charlie Allen, Brian Postman and Tom Watson for providing scans for today's post. Thank you Leif for doing more then your share to bring light to a artist who gets passed over ,often for more flashier practitioner of the craft or ones who became well known for cheesecake .I hope this Sickles book gets the ball rolling for other books and such. I agree with Jay. With Sickles there were no flashing lights or neon signs... just pure, unadorned drawing ability that was almost supernatural, he was so good. Leif, I haven't been able to get my hands on a copy of this great new book but I am curious about the reproductions. Are any of them made from the originals? Thanks for continuing with these images, that 'Bruce Stevenson' one of Sickle's has so much weight, so much power, wow. 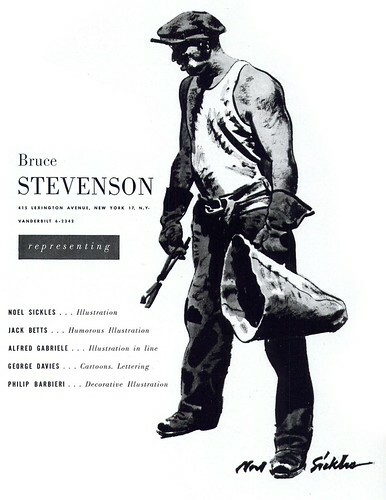 Yes, that Stevenson drawing shows what Sickles is all about-- the drawing is all shadows and half tones except for the one part that most interested him-- the swooping folds of the shirt under that muscular arm. That is the only part of the picture in stark, black and white contrast. 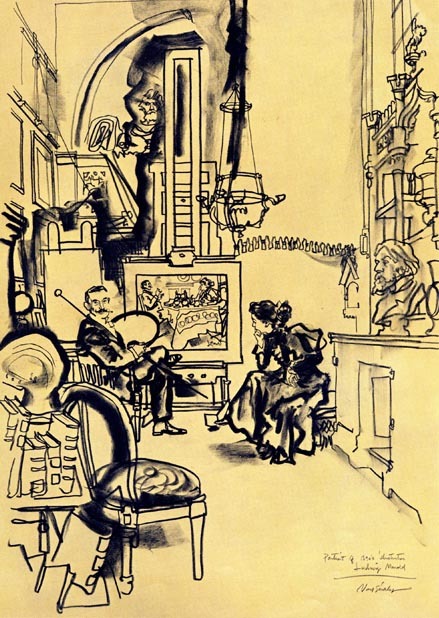 Sickles knew how to set priorities in a drawing (unlike so many artists who labor away with cross hatching and detail and make every part of the image equally important). 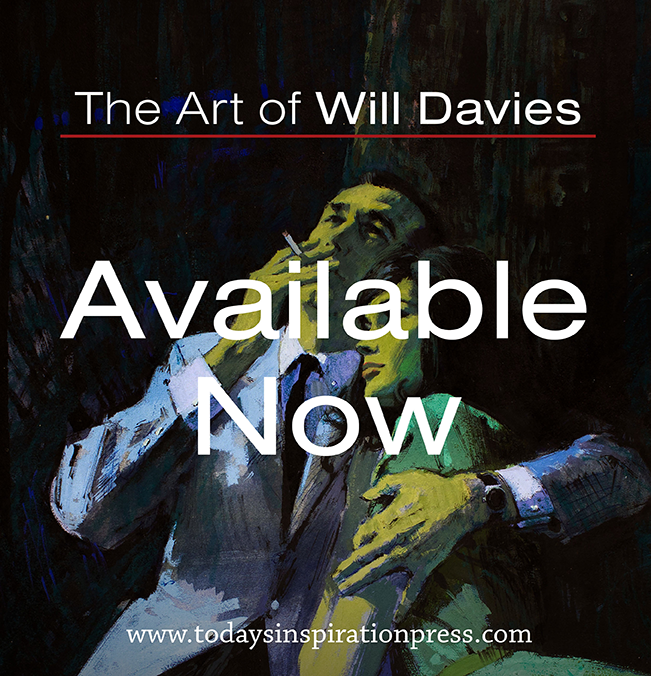 David; the book is a treasure trove of reproductions, many from the originals as far as I can tell, including tons of roughs and sketches, prelims, etc. Even so, there was some overlap - but mostly you've been seeing material that isn't in the book these past five days. Noel Sickle's illustrations has a special place in my heart. I remember seeing his illustrations for the first time in the early 60's, and his line work epitomized everything that was being taught in most of my illustration classes several years prior. His ability to simplify line and form with his obviously confident draftsmanship, was truly astounding. 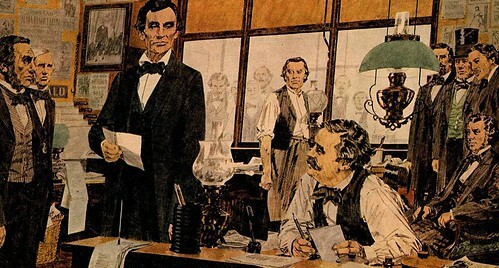 After all these decades, I still find his work exciting and incredibly well drawn. 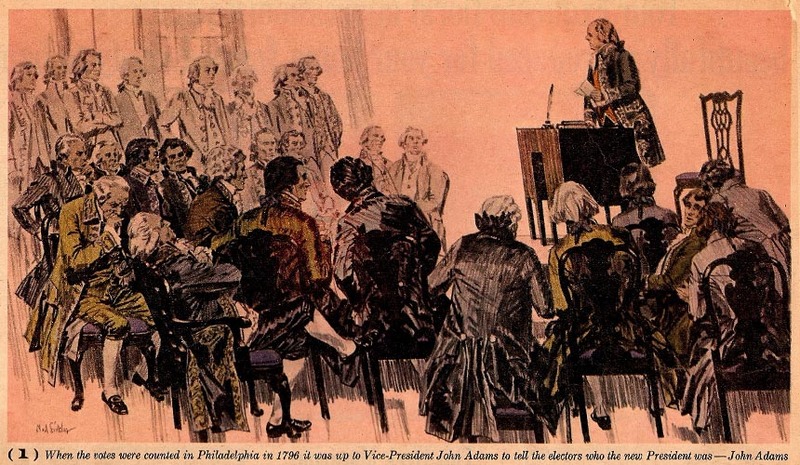 I love the way he would lean his figures to the right or left as in the Abraham Lincoln illo and the illo of colonial men seated listening to a speech. He gave energy and movement to an otherwise static scene. Intelligence and great taste had to be a key ingredient to his great talent.